Up there was the steeple. Open it up and there’s … no people. Unless, of course, it’s party time at Dan Riccobon’s house, the former Emanuel Lutheran Church in East Pittsburgh. He bought the brick building in 1998 from a congregation that by then had dwindled to about 40 elderly members, and he’s spent much of his free time over the past dozen years converting it into his home and studio. It’s an artful renovation to which Giordano Riccobon has brought his woodworking, ceramic and decorative painting skills and an aesthetic inspired by trips to Venice and his native Trieste. After World War II, his family’s farm overlooking the Adriatic Sea fell on the Yugoslavian side of the Morgan Line demarcation. “They just came one day and told my dad he had to go. We could wait 10 years for housing or go to the United States,” where an aunt and uncle awaited them in Pittsburgh. Mario Riccobon, his pregnant wife Silvia and their four children immigrated in 1951. “A lot of what I do, whether it’s in the building here or in my artwork, is rooted in the continuous lineage of history,” he said, a commitment reinforced on return visits to Italy’s ancient steps and fountains worn smooth, where he overhears the same conversations from Italians perched on them. 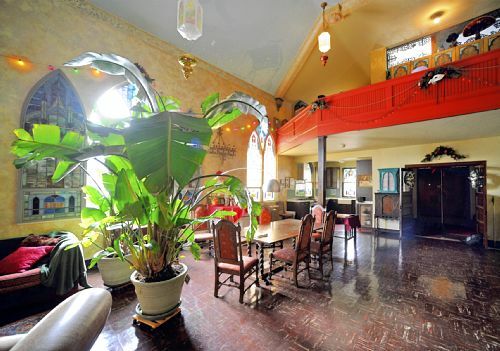 In East Pittsburgh, acting as architect, contractor, carpenter and interior designer, Mr. Riccobon has done most of the work himself, from removing the rotting steeple to building the bathroom and kitchen to painting the ceiling of the nave, on his back on a scaffold, with the constellations and the creatures that inspired them. The result is a sweet, magical, handcrafted space suffused with warmth and a playful spirit of creativity. “I was giddy when I first moved in,” said Mr. Riccobon, a painter and retired Woodland Hills art teacher. By then, some of the biggest jobs were behind him, including rewiring the building, vacuuming soot from the attic and insulating it, and installing a shower in the basement. The congregation that built Emanuel Lutheran Church pretty much lived and died with the Westinghouse plant just across the street. Westinghouse Electric built its primary plant in East Pittsburgh in the Turtle Creek Valley in 1895, making electric railway motors, generators, switches and other railway equipment. 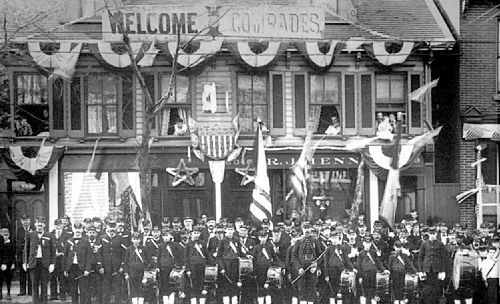 Two years later, German immigrants founded Die Reformations Gemeinde and built a frame church on a narrow, elevated triangle of land on Linden Avenue, then a bustling commercial street. In 1923, the church was demolished and the triangle leveled to build the new brick church. The congregation sold the building 75 years later, a decade after the Westinghouse plant closed in 1988. When Mr. Riccobon bought the church, the whole interior was painted white. When some of the paint began to peel, he discovered a decorative border just beneath the ceiling. He made a stencil from the fragment and restored the entire border, along with the church’s ochre-toned walls. 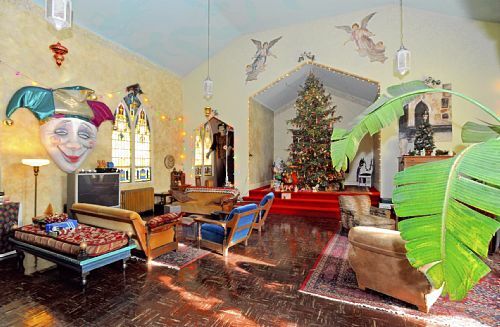 He’s also kept the painted angels-on-canvas that flank the apse, where his 15-foot balsam fir Christmas tree still soars. The nave — the large open area that makes up most of the interior — holds Mr. Riccobon’s living space, with two sitting areas and a dining table near the new kitchen. Until last June, he used the larger kitchen in the basement but tired of running up and down steps to prepare meals. So he turned the church’s coat closet into his new kitchen, building the Craftsman-style cabinets from scratch using beadboard paneling from Construction Junction. The marble countertops, once part of the wall of a bank, came from CJ, too, as did the Carrara glass back splash. At a friend’s urging, he replaced several panes of the stained glass window above the kitchen sink with clear glass. Now he has a view of the Westinghouse Bridge. Oh gee, what a bathroom! 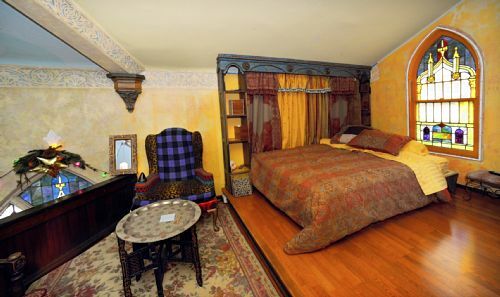 The former choir loft is his bedroom, with a homemade Murphy bed and a wall of IKEA cupboards painted to resemble an old Venetian screen. 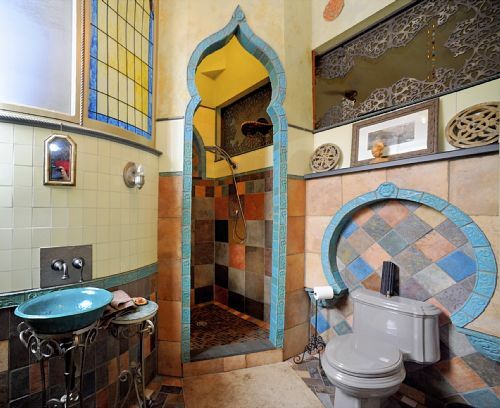 But the showstopper is the adjacent tiled bathroom and its ogee-arch shower opening. He made the turquoise tiles that frame it, glazing and firing them along with student work at Woodland Hills High. The bathroom’s curved wall (and curved interior windows; that was a challenge) was ordained by the circular staircase he installed to get to the bell tower, now a summer sitting area with sweeping views of the valley. Higher still and accessible by ladder is the open deck that held the steeple. The huge basement houses Mr. Riccobon’s painting studio, where he produces large-scale canvases based on his photographs of Venetian architecture. He uses some of the same techniques as in his decorative painting, creating built-up surfaces with a patina of antiquity. For a dozen years Mr. Riccobon had a studio in Oakland, where he worked on sets and costumes for the late Don Brockett’s productions. The Jack Lambert head atop the library’s bookshelves is a relic of that era. He made the big harlequin head mounted on the west wall for a Mardi Gras party he threw in 2000 for the teachers he’d worked with at several Woodland Hills schools. 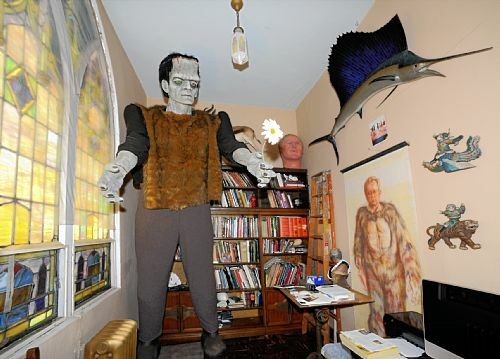 He created the King Kong head and the 11-foot-tall Frankenstein that looms over the library alcove for one of his Halloween parties. For Mr. Riccobon, the best part of having home and studio in the same building is not the easy commute but having work in progress so close at hand. He has a word of caution for anyone considering buying a church for living space. Before you can bid on the building, he said, you’ll need a mortgage approval, and to get that you’ll need an architect’s renovation drawings and a contractor. He ended up taking another route, paying with cash socked away during all those years living in the third-floor walk-up. That left him little money for the major renovation he’d been contemplating, but that turned out to be a good thing. “It allowed me to live here and get a feel for what I needed,” he said. “If I hadn’t, it would have been a disaster. I had thoughts of putting in a second floor. Madonna del Castello Church, 7416 Duquesne Avenue, Swissvale. 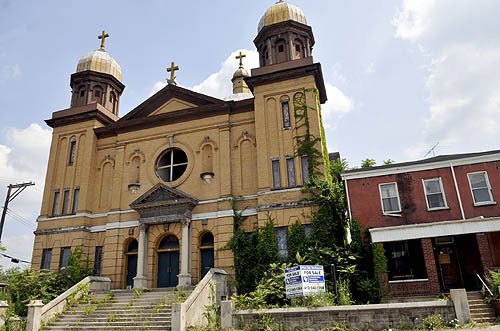 The Madonna del Castello Church at 7416 Duquesne Avenue in Swissvale has sat vacant for five years since its congregation left, leaving the unique brick building to fall into considerable disrepair. The church will experience new life as (a) condominium complex thanks to a partnership between the community, The Mon Valley Initiative, and the Swissvale Economic Development Corporation, who have begun construction that will incorporate many of the church’s original architectural features into the redesign. 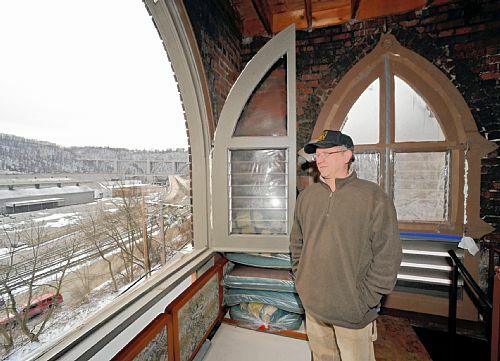 “Its reuse as a church wasn’t going to be feasible so we looked at other options to maintain this part of the neighborhood,” says Patrick Shattuck, senior real estate developer for The Mon Valley Initiative, who purchased the property last September for $10,000. Working with plans by Lami Grubb Architects, Mistick Construction is currently installing structural steel supports and expects the project to be completed by late spring or early summer. The plaster moldings and original arches will stay, becoming part of the new townhouse-style condos. Three of the four condos will be 1,600-square-foot, two-bedroom, one-and-a-half-bathroom units. 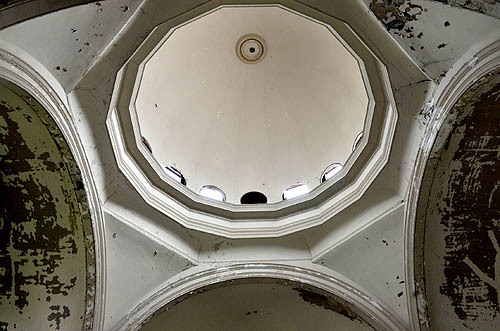 The fourth condo will be a 2,400-square-foot, three-bedroom, two-and-a-half-bathroom unit, which will feature the large dome that is currently over the altar as part of the space. The condos will range in price between $80,000 to $105,000. A former rectory and convent next door to the church had to be demolished but the vacant lot where they once stood will soon be put to good use. “We had hoped to renovate the buildings, but ultimately they proved to be too far gone. It is a buildable lot, so whether we include that in the future phase for a house or whether we leave it for public green space will be determined,” says Shattuck. t’s easy to overlook the oldest churches in Pittsburgh. “Then, you come inside and see how beautiful it is,” says Sean O’Donnell, secretary at Smithfield United Church of Christ, one the city’s four oldest houses or worship. The others — all soaring stone structures within blocks of each other — are the First Presbyterian Church and Trinity Cathedral, both on Sixth Avenue, and the First English Evangelical Lutheran Church on Grant Street. One claims the grave of a Shawnee Indian chief. One has 13 Tiffany stained glass windows insured for $2 million. One boasts the world’s first architectural use of aluminum. One has a marble, wood and brass altar once exhibited at the Carnegie Museum of Art. Each offers an oasis of quiet — at no charge — and sights to please even the most agnostic art lover. All offer free, informational brochures and tours upon request. “These are real treasures for people to look at,” says the Rev. Catherine Brall, canon provost at Trinity Episcopal. Visiting the churches helps one appreciate the city’s architectural history, along with “the depth of faith and piety that created these beautiful buildings,” says the Rev. David Gleason, senior pastor at First English Evangelical Lutheran Church. On a recent Friday, the First Presbyterian Church wowed curious passers-by from Wyoming, Arizona, Ohio and Virginia. “I think going to a church is a beautiful thing, regardless of your religion or politics. There are so many aspects that can be shared and appreciated,” says Morrison Simms of Jackson Hole, Wyo. Simms’ companion — Stuart Herman of Scottsdale, Ariz. — believes a visit to such places helps couples discover and appreciate each other’s interests. “It opens dialogue,” he says. Two of the churches — Trinity Cathedral and First Presbyterian — also offer sit-down eateries for weekday visitors. The Franktuary at 325 Oliver Ave. — under Trinity Cathedral — offers vegetarian, organic beef and gourmet hot dogs from 10 a.m. to 3 p.m. Mondays to Fridays. Our Daily Bread at 320 Sixth Ave. — under the First Presbyterian Church — serves hot lunches, soups, sandwiches and salads from 10:30 a.m. to 2 p.m. Mondays to Fridays. Trinity Cathedral (1872), Architect: Gordon W. Lloyd. Trinity Cathedral and the First Presbyterian Church share a former American Indian burial ground deeded by William Penn’s heirs to the congregations’ forefathers. French soldiers at Fort Duquesne (1754) and British soldiers at Fort Pitt (1758) also used the ground for burials. Today, Trinity Cathedral maintains the last 128 marked graves of an estimated 4,000 people once buried on the site. The identified remains of many have been moved to other cemeteries. The unmarked bones of many others remain interred within a crypt in the sub-basement of First Presbyterian. Prominent folks recorded on the present tombstones include Red Pole, principal chief of the Shawnee Indian nation, and Dr. Nathaniel Bedford, Pittsburgh’s first physician and a founder of the University of Pittsburgh. Inside the cathedral, visitors will find hand-carved pews of white mahogany, a stone pulpit covered with intricate carvings of prophets, saints and bishops, plus, stained glass windows dating back to 1872. Trinity Cathedral, 328 Sixth Ave., Downtown. Hours: 7 a.m. to 1 p.m. Sundays, 7 a.m. to 5 p.m. Mondays to Fridays, 9 a.m. to 1 p.m. Saturdays. Services available at 12:05 p.m. Mondays to Saturdays and 8:45 a.m. and 4:45 p.m. Mondays to Fridays, and 8 and 10:30 a.m. Sundays. Details: 412-232-6404 or here. First English Evangelical Lutheran Church (1888), Architect: Andrew Peebles. A 170-foot-spire distinguishes the First English Evangelical Lutheran Church, second oldest structure on Grant Street. Only nearby Allegheny County Courthouse & Jail is older. Interior decorations include a contemporary cross by Virgil Cantini; the 500-square-foot “Good Shepherd” window of Tiffany Favrile glass, and a free-standing marble, brass and wood altar once displayed at the Carnegie Museum of Art. Also notable is the “The Presentation of Our Lord in Temple” lunette, a shimmery glass mosaic and cloisonne work made in the late 1800s. It hangs high above the church’s permanent marble altar. First English Evangelical Lutheran Church, 615 Grant St., Uptown. Hours: 8 a.m. to 4 p.m. Mondays to Fridays; 8:30 to 12:30 p.m. Sundays. Services available 12:10 p.m. Mondays to Fridays, 8:30, 9:45 and 11 a.m. Sundays. Details: 412-471-8125 or here. Tiffany Studios designed 13 of the church’s 26-foot-by-7-foot stained glass windows, now insured for $2 million. All were hand-painted, making them unique among Tiffany windows. The Tiffany windows, however, are just a few of the 253 stained and leaded glass windows throughout the sandstone church. Also notable are two 80-foot ceiling beams — each cut from 150-foot Oregonian oak trees — plus, a pair of rolling, two-ton, 30-foot oak doors in the sanctuary. “They operate on a track in the floor. … and are so perfectly balanced that one person can open or close each one,” reports the church’s free guide for visitors. Visitors also will notice untold carved birds, animals and insects on the church’s interior stonework, including an eagle, butterfly and dove on the pulpit — representing the Father, Son and Holy Spirit. First Presbyterian Church, 320 Sixth Ave., Downtown. Hours: 10 a.m. to 3 p.m. Mondays to Fridays, 9 a.m. to noon Sundays. Services available at 12:25 p.m. Tuesdays and 10:45 a.m. Sundays. Guided tours offered after the 10:45 a.m. Sunday service. Details: 412-471-3436 or here. An airy, 80-foot aluminum steeple — supported by interior steel beams — marks the multilevel Smithfield United Church of Christ. It’s the sixth house of worship for the city’s first organized Christian congregation. The spire “has the distinction of being the first architectural use of aluminum in the world,” according the church’s Spire bulletin. Interior features include a 19-foot rose window made in 1860, and 12 towering, stained-glass windows that illustrate Biblical scenes and Pittsburgh history, including an 1861 visit by President-elect Abraham Lincoln. Smithfield United Church of Christ, 620 Smithfield St., Downtown. Hours: 9 a.m. to 3 p.m. Mondays to Fridays; 9:45 a.m. to noon Sundays. Services available at 12:10 p.m. Wednesdays and 11 a.m. Sundays. Details: 412-281-1811 or here. Maxo Vanka "The Battlefield" is a oil on canvas painting. Residents often know of special places in their towns that don’t make it into tour books, from the eye-popping taxidermy in the back of Joe’s Bar in Ligonier to the best crab shack between D.C. and Baltimore. A Pittsburgh secret that’s beginning to gain a wider reputation is St. Nicholas Croatian Catholic Church in Millvale. 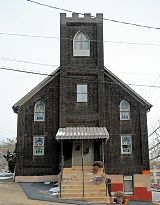 The nondescript little church is perched on a hillside in full view of thousands of Route 28 commuters, but few of them have seen the treasure inside. That’s changing as more people learn about it through public programs such as the current exhibition, “Paintings and Works on Paper by Maxo Vanka,” at Pittsburgh Center for the Arts. Maximilian “Maxo” Vanka (born 1889, Zagreb, Austria-Hungary; died 1963, Puerto Vallarta, Mexico) painted the murals that cover the interior of St. Nicholas in 1937 and 1941 as his way of expressing gratitude to his “adopted land.” What elevates them above traditional church murals is his incorporation of nationalistic and political subject matter. Maxo Vanka sketch study for the mural "The Battlefield." 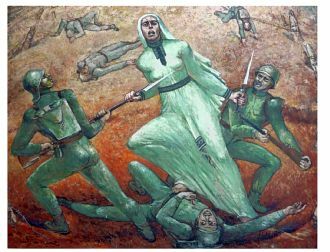 Maxo Vanka mural "The Battlefield." The mural is at St. Nicholas Croatian Catholic Church in Millvale. The center exhibition comprises 47 works by Mr. Vanka on loan from his descendants, the Brasko family in eastern Pennsylvania, including most significantly some of the drawings and paintings that were preparatory for the Millvale murals. These illustrate the compositional permutations Mr. Vanka tried out as he developed ideas and configured them for available spaces. The works also show that he was an excellent draftsman, as in a beautifully realized sketch of a torso, or pencil drawings of scenes in New York’s Depression-era Bowery. Paintings range from a tender large family portrait of his wife and young daughter (he’s present as a reflection in a carefully placed mirror) to a gruesome anti-war protest parade. While some of his themes, such as labor and family, were present in Works Progress Administration murals, Mr. Vanka’s Millvale works “contain a moral intensity and socially critical perspective not generally found in the idealized image of America that emerged within much of WPA art,” Barbara McCloskey, associate professor of art history, University of Pittsburgh, wrote in an essay for the nonprofit Society to Preserve the Millvale Murals of Maxo Vanka. Dr. McCloskey also recommended Heidi Cook, a graduate student in Pitt’s Department of the History of Art and Architecture, to the society when it was looking for someone to catalog Mr. Vanka’s artworks and archives stored at the family home. Ms. Cook spent two weeks this summer in residence there, making notes about each work she uncovered, including size, inscription and label information when present, and condition, and photographing it. She then spent several more weeks in Pittsburgh to enter that information into a digital database. She estimates there are approximately 1,000 artworks, including paintings, works on paper and sketches in storage, and that she was able to catalog about 20 percent during her stay. Ms. Cook observed that Mr. Vanka was “really prolific” and that he continued to paint throughout his life. She noted many smaller works, including still lifes and landscapes, possibly made to keep in practice, and large-scale paintings inspired by world travels with his wife, including of festivals in Japan and Bali. A powerful and disturbing painting inspired by an Indian leper colony is in the center’s show. Ms. Cook initially intended to study modern German art, but her experience with Mr. Vanka has her considering the broader topic of Central and Eastern European art. She’s researching traditional folk costume — something Mr. Vanka incorporated to make political commentary — for her master’s thesis. There is intent to catalog the remaining works, but that is dependent upon the society finding funding to do so. I hope that happens because such projects bolster knowledge about the artist and are essential steps to ensuring the art’s survival. Word-of-mouth equity can go only so far. Three paintings by Mr. Vanka’s great-granddaughter, Marissa Halderman, that are responses to particular works of his, are also exhibited. The exhibition continues through Nov. 7 at 6300 Fifth Ave. at Shady Avenue, Shadyside. Hours are 10 a.m. to 5 p.m. Tuesdays through Saturdays and noon to 5 p.m. Sundays. The center has produced a full-color catalog ($12) and poster ($18) for the exhibition. 412-361-0873 or http://pittsburgharts.org. An exceptional work of art, “Structure of Shadow” by Philadelphia-based artist Bohyn Yoon, is at the Pittsburgh Center for the Arts through Nov. 7. “Silver Worlds: Photography’s Wet Plate Era” is the subject of a talk beginning at 7 tonight by Linda Benedict-Jones for Conversations & Cocktails at The Frick Art Museum, Point Breeze. It’s held in conjunction with the exhibition “For my best beloved Sister Mia: An Album of Photographs by Julia Margaret Cameron.” Ms. Benedict-Jones is curatorial chair, exhibitions and curator of photography, Carnegie Museum of Art. Completing the evening will be hors d’oeuvres, a gallery discussion and the featured cocktail, the Royal Silver, which honors the silver halide coating critical in the production of photographs produced using the wet plate or collodion process (4 ounces champagne, 1/2 ounce Cointreau, 1/2 ounce Poire Williams liqueur, 11/2 ounces grapefruit juice). Advance registration with payment required at 412-371-0600; $25, members $20. The second in Carnegie Museum of Art’s “What Are Museums For?” series, “Exhibitionists Unite: How Art Exhibitions Are Born,” will be held at 6:30 p.m. Thursday. Staff members will give an inside look at what goes into bringing a show to you, using the current exhibition “Ordinary Madness” and upcoming “Paul Thek: Diver, A Retrospective” as examples. Learn about the issues museum professionals resolve as they serve the public, and follow up with your own questions. Free; reception and cash bar follow. 412-622-3131 or www.cmoa.org. Michael Sriprasert promised Wilkinsburg residents on Tuesday that they would have new neighbors next fall. Mr. Sriprasert, director of real estate development for the Pittsburgh History & Landmarks Foundation, is overseeing two new housing projects in Wilkinsburg worth almost $10 million. “By this time next year, we’ll have 27 new families moving in,” he said. He was one of 10 speakers representing a consortium of government agencies, foundations and financial institutions that have undertaken housing restoration projects in the borough’s Hamnett Place neighborhood. The session to announce the two latest elements in the renewal plan was held at the new Landmarks Housing Resource Center on Rebecca Avenue. “This investment will expand our ability to attract people back to Wilkinsburg,” Mayor John Thompson said. The larger effort is an $8.6 million renovation of two early 20th century apartment houses. They are the Crescent Building, at Rebecca and Kelly avenues, and the Wilson Building, about a block away on Jeanette Street. Both structures are in poor shape. A portion of the roof of the three-story Crescent Building, for example, has collapsed. The two apartments have long been eyesores, officials said. “If we can restore the Crescent Building, that will build belief in Wilkinsburg,” said county Councilman William Robinson, D-Hill District. His council district includes Wilkinsburg. When work is completed next year, the two buildings will have a total of 27 one-, two- and three-bedroom apartments. Each building will have a community room, laundry area and computer lab. Hosanna House will provide support services to tenants, who must meet income guidelines. The second project, budgeted at slightly more than $1 million, will restore three abandoned but architecturally significant homes on Jeanette Street and Holland Avenue. When renovations are complete, those homes will be for sale to buyers who have earnings no greater than 120 percent of the area’s median income. The apartment project also involves acquisition and demolition of three neighboring structures. It is being funded by loans and grants from Allegheny County’s Department of Economic Development, funds raised by the sale of Historic Tax Credits, private dollars from the Federal Home Loan Bank of Pittsburgh and federal tax credits administered through the Pennsylvania Housing Finance Agency. Money for restoration of the three homes is being provided by Allegheny County and the Scaife Foundations. Four other homes in the neighborhood have been renovated recently with help from the county and the Scaife Foundations. They have been sold and four families have moved in, Mr. Sriprasert said. The restoration costs for the houses and the apartments are more than $300,000 per unit, about four times the median cost of a home in Wilkinsburg. Those costs are high because of the dilapidated condition of the structures and because restoration, which often is more expensive than demolition and new construction, will save architecturally interesting buildings, Mr. Sriprasert said. The project is being funded in part with historic tax credits, which means it has to meet strict criteria for restoration, he said. Supporters hope the restoration projects will produce a ripple effect, Mr. Sriprasert said, encouraging businesses and homeowners to invest private dollars in the neighborhood. Tuesday morning’s program also marked the grand opening of the Pittsburgh History and Landmarks Foundation’s housing resource center. It is located at Jeanette Street and Rebecca Avenue in a former Packard dealership. The Landmarks Housing Resource Center will have a community open house for people in the neighborhood at 11 a.m. Saturday. That event will be followed at 12:45 p.m. by an inaugural workshop on the topic of restoring vacant lots as gardens and green spaces. The cost for the workshop is $7. To register, call 412-471-5808, ext. 527, or e-mail marylu@phlf.org. Public knowledge of East Liberty’s past is stuck on urban renewal, high-rises and crime. But that era was a blip. East End history buffs hope to put the past in perspective Saturday at the East Liberty History Festival, a first-time event in a neighborhood of firsts. What most people don’t know about East End history — with East Liberty at its hub — would overflow the parking lot at Eastminster Presbyterian Church, but the day-long event of the East End/East Liberty Historical Society has been designed to fit there, for free, from 10 a.m. to 7 p.m.
From Indians and traders to the first immigrant settlers, the festival will highlight the progression of development and industrial change that brought unparalleled prosperity to the area. In a recent Arcadia “Images of America” publication, the title “Pittsburgh’s East Liberty Valley” was chosen to encompass the breadth of East Liberty’s influence. Historical society members who put the book together said many images that would today be in Shadyside or other adjacent neighborhoods were then described as East Liberty. Al Mann, a retired chemical engineer from Highland Park, has been at the helm of planning the festival for the past year as the society’s president. In a bag behind the driver’s seat of his car, he has been carrying around items for display, among them a large aluminum mold of an Easter bunny. The mold was used at Bolan’s Candies in East Liberty, the first of the family’s several stores, open on Penn Avenue from 1918 until several years ago. “We have a lot of firsts,” said Mr. Mann. The first commercial oil refinery in the nation was in Highland Park, and the society has the papers to prove it. The first radio broadcast of a church service was from Calvary Episcopal in Shadyside in 1921. The nation’s first drive-up gas station was at Baum Boulevard and St. Clair Street. Pittsburgh’s first traffic light was at Highland and Penn avenues. Festival highlights will include re-enactments of processes developed by industrialists who lived or did business in the East End. Aluminum will be melted in a small crucible furnace and poured into medallion molds with street car emblems. Those will be sold to the public. Bus tours throughout the day will take people to points of interest that include the Highland Park reservoir, a Negley family burial marker, grand churches, the Kelly-Strayhorn Theater and a house that encases a log cabin built in 1794. Exhibits will show the historic transitions of Calvary and St. Andrew’s Episcopal churches and a wall of fame reproduced from panels in the Kelly-Strayhorn. The photos of performing artists and other celebrities attest to the role the East End played as a breeding ground for the entertainment industry. Ms. Evert said her interest stems from working and worshipping in the East End. She lives in Fox Chapel. When the society formed in 2002, she said, it was in part to interest people in the East End’s future. 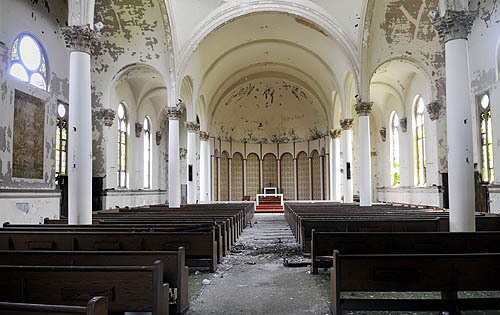 Three years ago, the stately 19th-century sandstone church at Friendship and South Pacific avenues in Bloomfield lay in ruins and was targeted for demolition. 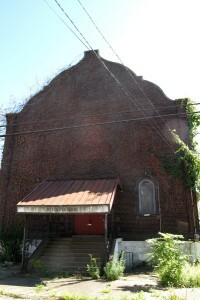 Since then, all manner of angels have descended on the former Fourth United Presbyterian Church. More than 1,000 volunteers have helped to replace the roof, tuck-point the sandstone walls and gut the interior, upgrading its plumbing, electrical and heating systems, replacing windows and framing out space for classrooms and a kitchen. Before the building celebrates its rebirth as Pacific Sanctuary, it will need a few more angels. Earthen Vessels Outreach, which bought and rescued the building after it was slated for demolition three separate times, is trying to raise an additional $100,000 to finish a community center on the ground floor for the hundreds of at-risk children it serves from five Pittsburgh neighborhoods. Thanks to volunteers and donated materials, the organization has spent only $450,000 while accomplishing an estimated $1.2 million to $1.5 million in improvements, project manager Ryan England said. Most of the remaining work is finishes — flooring, ceiling tiles, lighting and bathroom fixtures. Volunteers will continue to buzz about, but some of the work requires the hiring of skilled professionals, Ms. Chaney said. Mr. England, a California native who earned his master’s in civil engineering at Carnegie Mellon University and decided to make Pittsburgh his home and community service his vocation, said he can finish the ground floor in four to six weeks if funding is secured. The group serves about 200 children from Bloomfield, Garfield, East Liberty, Lawrenceville and Friendship on a regular basis and about 200 more sporadically with its after-school, day camp, performing arts, recreation and other programs. “We feed every child who comes through our doors,” Mr. England said. The group serves 12,000 meals a year from its tiny kitchen. “It’s a real struggle,” he said. The ground floor of the church is being renovated to provide four classrooms — the current headquarters has none — plus a bigger kitchen and large gathering area. Longer-range plans are to convert the main level upstairs into a recreation center and worship space for Seeds of Hope Church, also founded by the Chaneys, who moved to Pittsburgh from Chicago to launch their urban ministry about 10 years ago. The church was built in the 1890s. Fourth United Presbyterian Church closed in the 1960s and was rented as a school building for about 10 years before being sold to a pair of ministers in 1976. Their congregation eventually abandoned the building and decay set in. “When Ryan and I walked in, there was six inches of water on the floor,” Ms. Chaney said. “And mold everywhere,” Mr. England added. Mr. Chaney had tried to buy the church for years, once offering $250,000. When Earthen Vessels Outreach finally purchased it, in shambles, it fetched just $65,000. Finishing the community center will enable the organization to gain the certification it needs to qualify for federal and state funding and expand its mission, the Chaneys said. “We want it to be a peaceful place for young people to come and grow as human beings,” Mr. Chaney said. To learn more about Earthen Vessels Outreach or to donate, visit www.evo-pgh.org or call 412-681-7272.